Palm trees, warm sun on your back, tall buildings blocking your view of the beach… we must be at the Gold Coast. Ah hey guys! We’re here at the 2019 Giant dealer show at the Marriott hotel which has the best chandeliers and the worst carpet on the Gold Coast. 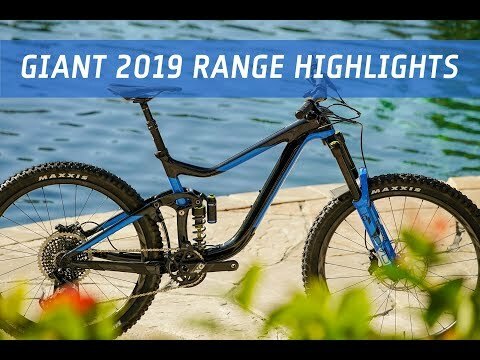 2019 is definitely a year of evolution rather than revolution for most of the Giant range, obviously excluding their new e-mountain bikes which we’ve looked at extensively already on the site, so we’re not going to go into them here. If you want to see more about the new Trance E+ and Intrigue E+ range jump on to flowmountainbike.com. So leaving out the e-bikes let’s have a look at a few highlights from the range. We’ll start at a lower price point. The Stance is now a really appealing looking bike. Gone is the clutter of the external cables. it’s all really neat now, the paint job looks fantastic and that is a big deal at this price point in particular. For $2300 this is a really sound option to get yourself out into the trails on your first dual suspension bike. How you doing? No, I didn’t order any chips. Now the Anthem goes completely unchanged for 2019. It was launched to a lot of fanfare last year, it was exactly the bike that Giant needed to get back in the 29er game. We were half expecting Giant to release a version of the Anthem with a dropper post and maybe with a 120mm fork because that seems to be what everyone else is doing with their XC race bikes at the moment, but we didn’t see that. Still it does hit some really tasty price points. The Anthem 2, for instance, coming in at $3799 is probably our pick of the bunch when it comes to the the value for money stakes, so one to look out for Barely see out of these things… There is one bike that really, really stands out and we are talking about the top-of-the-line Anthem Advanced 0 which is equipped with the new Fox Live suspension, their new electronically damped suspension system which we really aren’t at liberty to tell you too much about yet unfortunately, other than that it’s very cool. We’ve been riding it for a few weeks, we’ve been lucky enough to get our hands on an early release sample of this stuff and holy moly really incredible technology. We wish we could tell you more. The production version this bike will be using the new 12 speed XTR plus of course the Fox Live suspension system. Now price tag is 11 grand which is not but something we’re accustomed to seeing from Giant but entirely justifiable in this instance, we can promise you. Likewise there are no changes to the Trance platform either it’s exactly the same frame as found in 2018. But there is one model that we’re just absolutely in love with, the top-of-the-line Trance Advanced 0. What we like about this bike is that it comes with a full DVO suspension package with the Topaz 2 shock and the Diamond fork. Pricing on that model comes in at $8699 which is right up there but you can’t ask for much more in a trail bike. The partnership between Giant and DVO suspension is a really interesting one. To have the biggest bike manufacturer in the world teaming up with a smaller manufacturer like DVO isn’t something that you would have predicted. The whole partnership is driven by what’s going on in the race team. Now DVO is the sponsor for the Giant Factory Off Road team and so we’re seeing that partnership trickle down into the consumer range which we think is so cool. DVO suspension has a great reputatio,n it’s got good support here in Australia through NS dynamics, so we’re looking forward to testing out some of these DVO equipped Trance and Reign models in the future. The top of the line Liv Advanced 0, the Hail Advanced 0 rather, is coming with DVO front and rear – it’s so cool to see, definitely a very boutique name and as we said a really interesting partnership. Now Giant’s carbon wheel program has been given a massive makeover for 2019 because apparently quite a few people were destroying some of their rims, so they’re now coming up with a much stronger rim design, both the cross country and for trail/enduro users. They’ve gone to a hookless bead design which allows them to make a much stronger rim profile around that bead hook area. The rims are much wider as well so talking about a 30mm internal width for the trail/enduro rim and a 25mm internal width for the XC carbon rims. You know the Jupiter’s casino million dollar question is “what is behind that black embargo screen in the corner of the dealers’ showroom?” We haven’t been allowed to look as media though a lot of the dealers have been allowed in to have a look, obviously having had to get rid of their phones and all that kind of stuff first, so they can’t snap any pics. Giant also stationed a fairly heavily tattooed angru looking man on the door, so we weren’t really game to try and sneak our way in. Anyhow if we had to hazard a guess as to what is inside there we’d say it has to be a Trance 29er or something like that, a 29er trail bike anyhow. Giant obviously have a great 29er Anthem race bike now in the cross country category, but they don’t have a 29er trail bike so we feel it’s got to be something in that space. We have to wait and see though, hopefully in a couple of weeks’ time we will know.